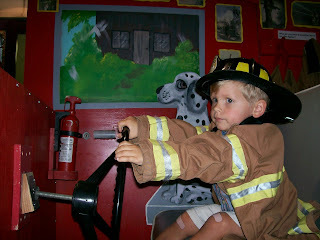 This is one of my favorite pictures - Dawson the firefighter. 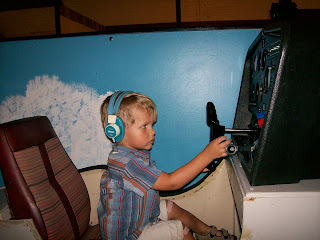 Dawson driving the bus at the children's museum. 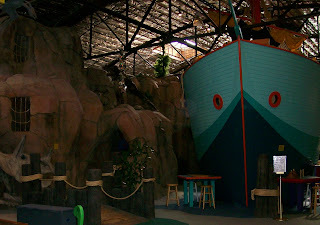 There was a very large boat at the Tyler children's museum. 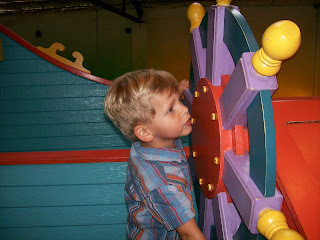 Dawson's favorite feature was the giant wheel and he spent a great deal of his time at the museum driving the boat. 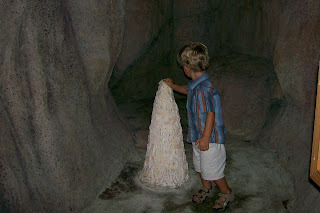 Here are some pictures of Dawson exploring the caves at Discovery Science Center in Tyler. 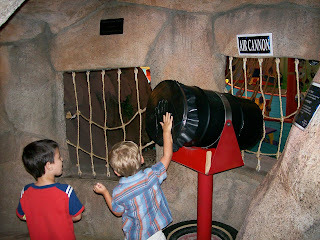 As you can see, he also enjoyed pounding on the air cannon located at the top of the cave. 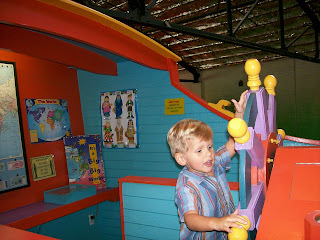 Of all the exciting things at the children's museum in Tyler, Dawson plays with a telephone. 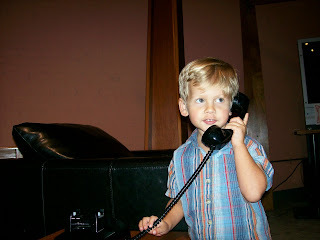 As I've mentioned before he loves imaginative play and pretending to talk to others on the phone is one of his favorite games. 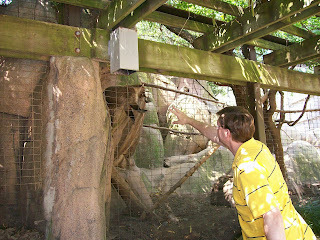 One of the neatest things at the zoo was our close encounter with a cheetah. 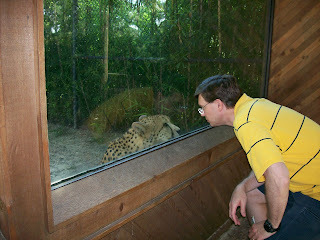 As you can see, he/she came right up to the glass to take a closer look at us. 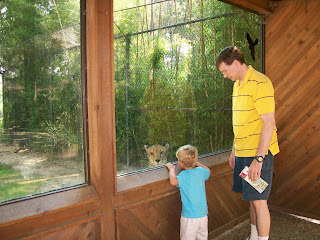 Dawson really enjoyed seeing the "big kitty" up close. 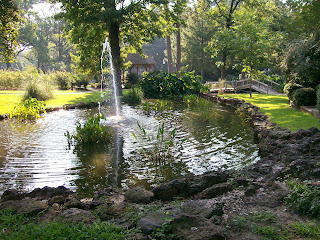 Caldwell Zoo in Tyler is beautiful!! 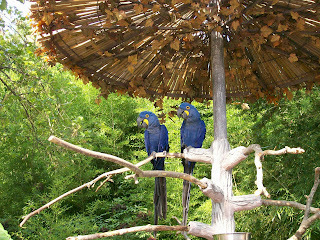 There are lots of trees, winding sidewalks, and amazing natural habitats for the animals. 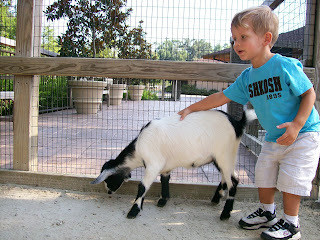 It's definitely one of our favorite zoos and we look forward to visiting again. 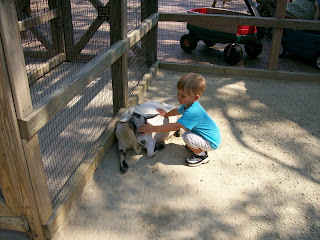 Since we've been home, Dawson's asked several times to go to the zoo again. 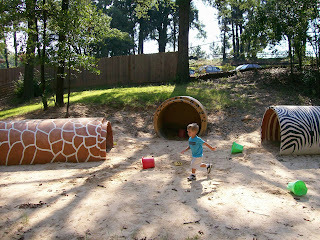 The Caldwell Zoo had a great big sand area where kids could play. 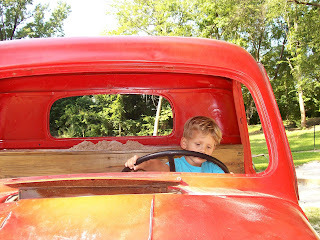 Stuck in the sand was an old truck. 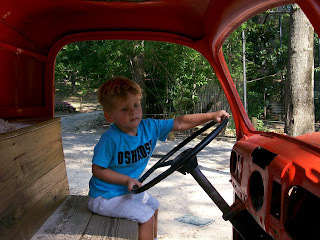 As soon as Dawson spotted the truck he ran to it, hopped inside, and started to drive. 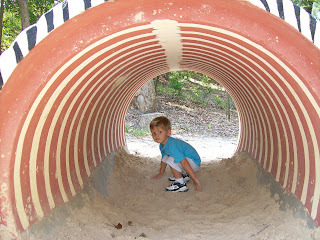 Here are some pictures of the animal tunnels at Caldwell Zoo. 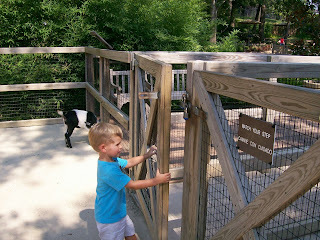 Of course, Dawson loved them and wanted to walk through all of them. 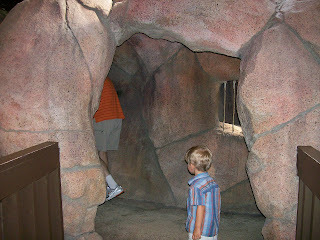 He also directed us as to which tunnels we should explore. 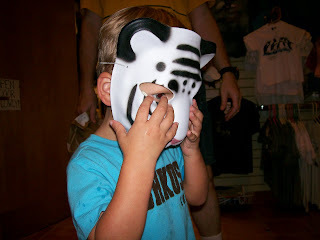 We had lots of fun trying on masks at the zoo store. 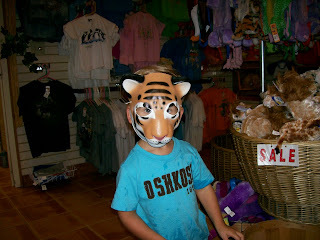 Dawson was so adorable in his masks!! 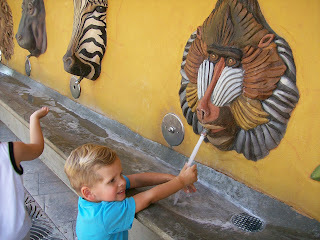 The hand-washing fountain outside of the petting zoo was as much of an attraction as the petting zoo itself. 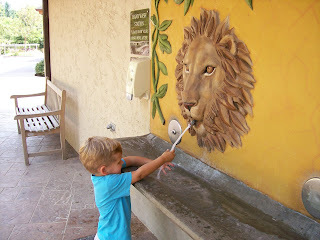 Dawson has never had so much fun washing his hands. 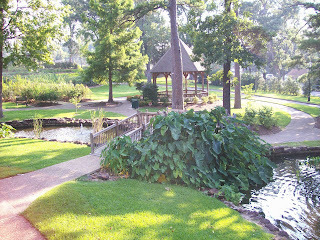 From Dawson's perspective, the highlight of the trip to Tyler was the pool at the hotel. Every day after nap, the first thing he would say is, "Now go to the pool." 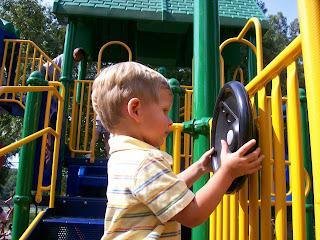 And we did go to the pool almost every afternoon. 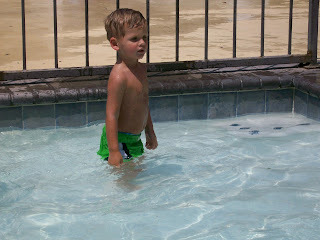 It's not that he's deprived of pool time because we go to our neighborhood pool (weather permitting) almost daily. 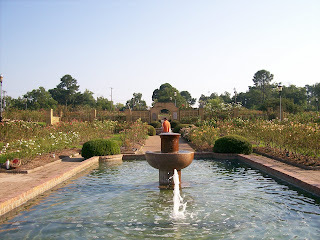 But this was a different pool and thus so much more exciting. 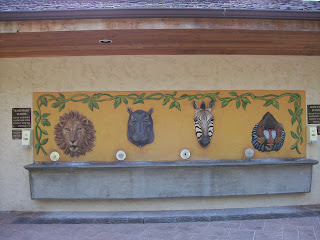 He especially enjoyed the lions-head fountains in the shallow pool. 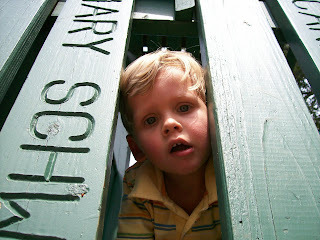 He liked to put his head under them and pretend it was raining. Dawson has become a very good swimmer lately. 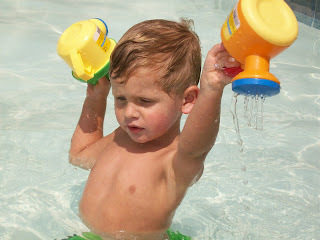 With his floaties on his arms he can swim all by himself. He is very excited about this new independence. 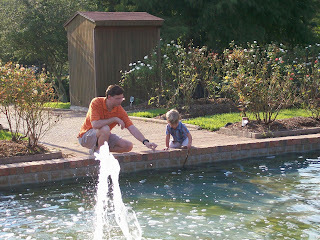 He used to push me away when I tried to hold him in the pool and would say, "No, mom. Let go, mom. Just let go." 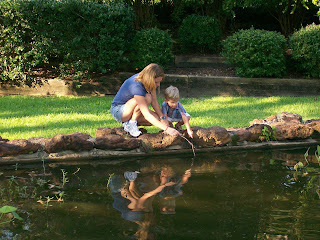 Of course, I couldn't let go or he would sink to the bottom. So now he's thrilled that I'm not holding onto him. 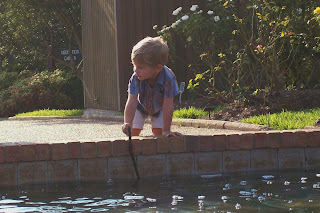 In fact, there are times when I just sit by the edge of the pool and watch as he paddles and swims around all by himself. 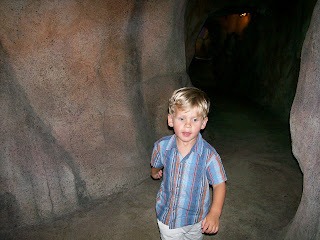 Dawson has also learned to hold his breath when he goes under water. And whenever his head does go under the water, purposefully or accidentally, he'll pop up and say, "I went under like big kids" and is so pleased with himself. 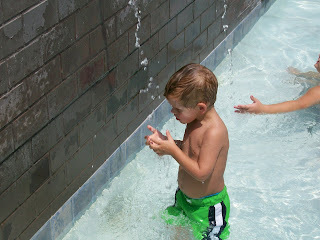 Today we had a big first at the pool. 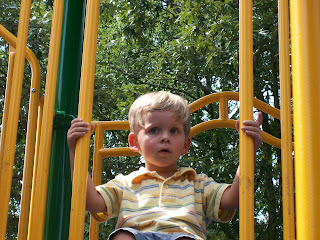 Previously, Dawson watched with glee as other children jumped off the diving board. 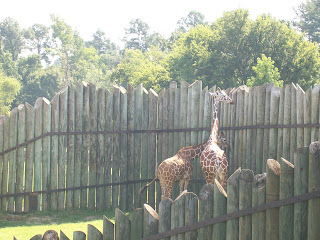 Well, today he went off the diving board!! 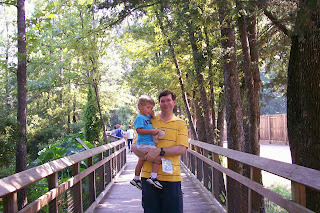 I was a little nervous, but he was all excitement and determination. I walked him to the edge, he jumped in, went completely underwater, popped back up to the surface, swam to the ladder and got out. He did this 3 times today and I'm sure many more diving board jumps will occur in the future. 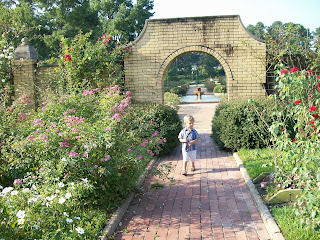 During our time at the rose garden, Dawson briefly attended to the roses, but was most interested in the various fountains. 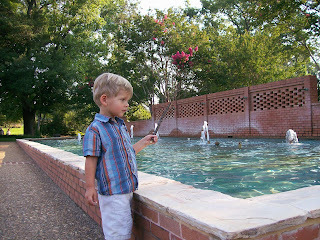 He even found a couple of sticks (aka fishing poles) and used them to catch fish in the fountains. 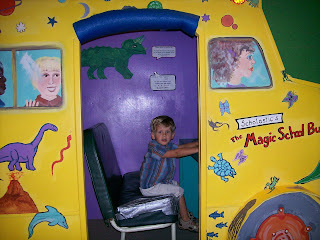 He has such a vivid imagination. 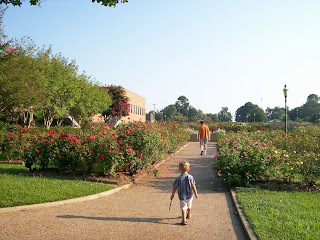 While in Tyler we visited the Tyler Rose Garden, the largest rose garden in the country. It was beautiful! 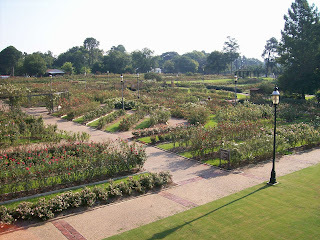 The roses were gorgeous and the landscaping was impeccable. We've posted a few pictures but even they don't do it justice. It's definitely something you have to physically see to appreciate. 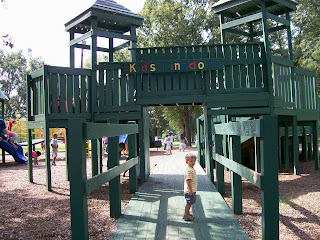 Not far from our hotel in Tyler was a really neat park with a big wooden fort as well as modern playground equipment. The day we were there the local YMCA day camp was there, as was a moms playgroup. 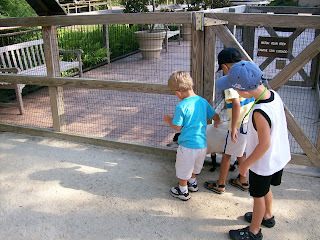 So there were many kids and lots of excitement. 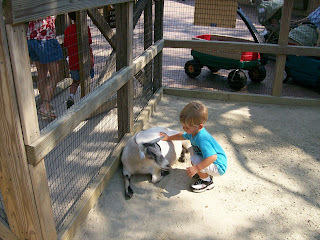 We stayed for over 2 hours and Dawson had a blast! 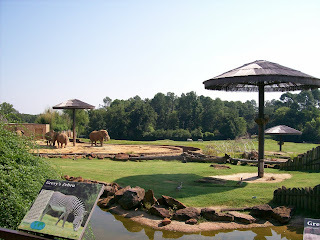 These pictures were taken at Discovery Science Center in Tyler. 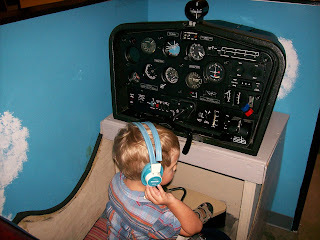 Dawson was very excited to see this airplane. 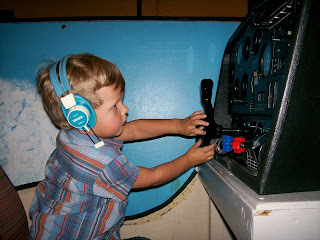 He immediately knew to put the headset on just like in Daddy's plane and he then proceeded to "drive" the plane.